The Adventures of Tioga and George: Break-Thru! 10:30am - In yesterday's Blog post, there was the story of Baby Boid deciding to jump on me and explore! Of course it's impossible to comprehend why on one single day, such a break thru would happen. When I was 13-years old, I got my first parakeet. Over the years, I've fine tuned how to get a bird like Boid to be tame. Move slowly around a new bird. Especially when reaching into the cage. Let the bird decide on its own when it will jump on you. ie; Don't chase the bird around his cage trying to get it to be on your finger! During my years RVing in Mexico [I lived in Mexico fulltime from 2007 to 2013], I bought a parakeet. His name was Baby Boid. I'd been working on the cabinet drawers for a couple of hours when I began to feel hunger pangs. Time for lunch! While eating, I read my email. One from a long time Reader asked me why it took me so long to finish the cabinet drawer project? 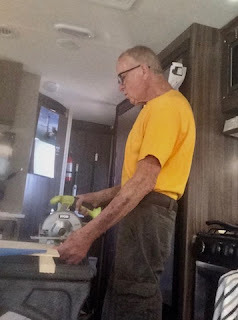 Her husband had glanced at my Blog, and being a cabinet maker, he got interested. Her husband told her, "I could have finished that whole thing in about 4-hours! He's been working on it for weeks!" I replied explaining about my being slow. "I love this work, and don't want it to end," I explained. This is true. But only partially true. I had worked for Emminger, a cabinet shop in Martinez, California. I started there as an apprentice in 1995. By 2000, I was still an apprentice, which meant that I worked assisting journeymen. Never on my own. I believed that I actually was a journeyman, but Emminger held me back to save money. That belief turned out to be false. I found out about that when I quit Emminger to work for another shop, and was hired on as a journeyman. On my first assignment, I was given the job of rebuilding a bank's interior. All by myself! All the counters and cabinets. Wow! I was sooooo happy! I struggled a bit building the cabinets and counters. Here I was, working all on my own for the first time because I had bluffed my way to being hired as a journeyman cabinet maker! I completed all of the cabinets and counters. Now came the installation. And I was to do that alone as well. Oh Lord! I had only gone out on a few installations at Emminger's. Now here I was installing an entire bank's worth of counters and cabinets all by myself! I had no idea how I was doing!? I knew something about cabinet quality. But had not a clue about how long a job like this installation should take! I convinced myself that I was making good time on this install. The customer paid for the job. That was a good sign! A couple of months later, I asked my shop's owner how I had done. He replied, "It could have been faster!" I'll never forget those words from him! Struck me low! Soon after that, I was diagnosed with cancer. That ended my cabinet making career. Love the Baby Boid video! That green Baby Boid was a real character! He loved to tease me. Did you see in the video how he kept flying on my head? I'd sort of brush him off, and back he would come on to my head. He loved to push things off my desk. He would get pencils and push them off. Then watch them fall to the floor. Then get another pencil, roll it to the desk's edge and down to the floor. He really enjoyed chewing up paper notes lying on my desk. Didn't you have 2 different Baby Boids while travelling in Mexico George? Baby Boid in the video showing him talking escaped. We were friends for about two years. He was green. After Boid escaped, I got another parakeet and also named him Boid. He was a blue parakeet. About two months after getting the blue parakeet, a guy knocked on MsTioga's door. When I opened the door carelessly, that Boid flew out.